It’s sewing Jim, but not as we know it! | Keeps Me Out Of Mischief! It’s sewing Jim, but not as we know it! I’m so pleased with this, I just have to share it with you… I’ll do a tutorial soon! A couple of months ago I went to an old school friend’s wedding. The reception was held in a house that did double duty as an art gallery. While I was there I noticed a piece of art that was created by sewing into plastic discs in circular patterns that were then attached to a piece of hardboard. I was inspired by this idea and when I found a stretched canvas hidden away in the spare bedroom (goodness only knows what I bought it for in the first place!) I knew immediately what I wanted to use it for. I experimented to see if you could sew through the canvas; it worked and this is the result, I’m so proud of it. I’ve got a couple more blank canvases to try this on, so I’ll do the photos for a tutorial when I do it – I forgot to take photos as I did this one, I got a bit over excited about it working! That is really cool. Good job! Thanks for visiting http://www.superdad247.com Claire. Oh and you are very talented. I loved the aprons from a previous post. ~Cheers, Gil. Thanks, I love making stuff that’s actually useful! This is super cute! Love it. 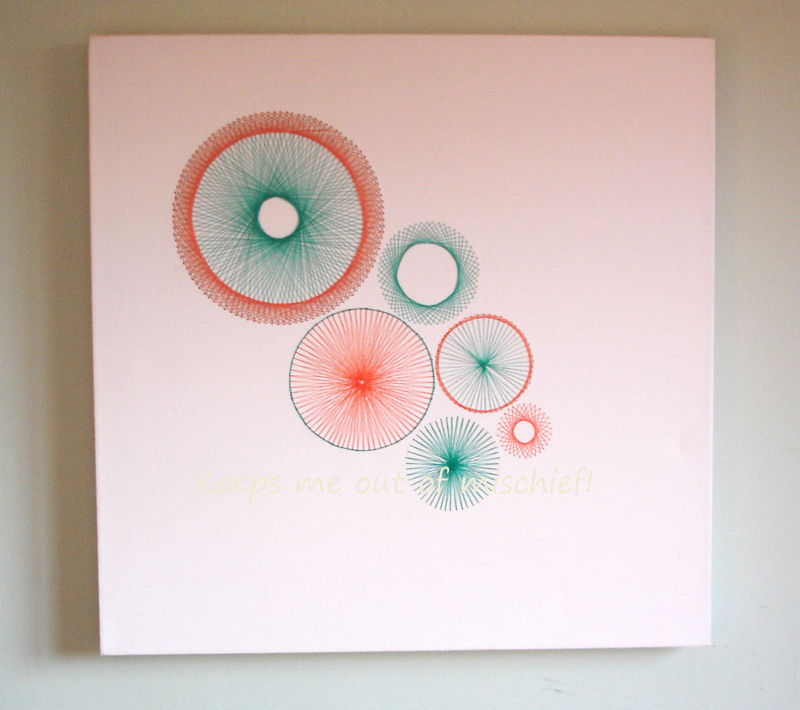 Look out for a similar project soon, a sunny housewarming gift for my sister! Pingback: Five Things Friday: Relaxation Ideas | Keeps Me Out Of Mischief!